Trey was born and raised in Gaffney, SC. He received a bachelor’s degree from North Greenville University majoring in Christian Studies and masters from Liberty Baptist Theological Seminary. Since surrendering to the ministry in 2002 Trey has spoken at numerous churches, youth camps, Disciplenow events, student rallies, colleges, FCA’s, First Priority Clubs, and has also preached overseas. 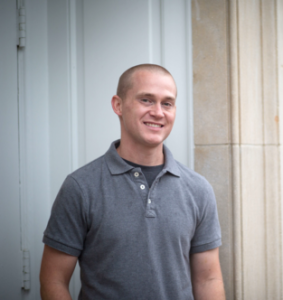 Trey has served in student ministry for several years and has also helped plant a church. He is passionate about preaching the gospel and seeing Jesus transform lives. Trey received Christ when he was eight years old and was raised in a Christian home. He began to feel God calling him into the ministry as a teenager but initially ignored it. Around the age of seventeen he began to fall away from God and for about a year and a half did what he wanted and followed the ways of the world. During this time he knew he was running and was miserable. This ultimately led to him hitting rock bottom and Christ getting ahold of his life. He realized that without Christ life wasn’t worth living and surrendered everything to Him. In January, 2002, he answered the call to full-time ministry. Since then has just wanted to honor Christ in everything he does and follow Him wherever He leads whether that be overseas or across the street. Trey loves to mentor and develop leaders by investing in their daily lives. Trey believes that every conversation and encounter is an opportunity to share Jesus with those who are hurting, lost, and need the gospel. Trey met his beautiful bride Melissa while in college and they married on May 7, 2005. They have three beautiful children and their names are Jaxson, Paitlyn, and Judah. Melissa is not only the love of Trey’s life and partner in ministry, but is also a speaker, writer, singer, and makes the best shepherd’s pie on the planet. Trey dislikes rats, the Duke Blue Devils, food without salt, negative attitudes, ladders, and math. Trey has been to Hawaii, been in a car that went over a bridge yet walked away without a scratch, talked to Sting (the wrestler) on the phone, and saw a possum get decapitated by a transfer truck, which he claims was one of the coolest yet disturbing things he ever saw.